The air fryer is becoming a popular kitchen appliance as a healthier alternative to deep frying. Fry anything in minutes! 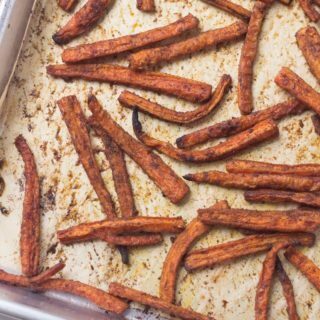 But for those of us without space or interest in yet another machine, I’m sharing how I make carrot fries in the oven by plain old roasting. 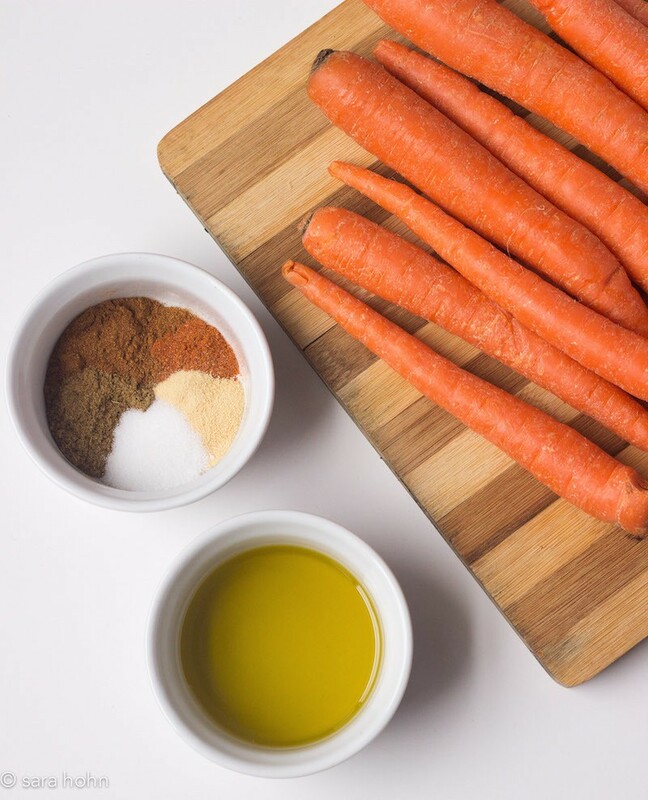 Those 1-pound bags of organic carrots are perfect for this recipe. I cut off the ends but never peel them. Here they are before tossing with the olive oil and spices. I typically line baking pans with parchment paper. It has so many kitchen uses, including preventing this pan from getting all gross. I love parchment paper. 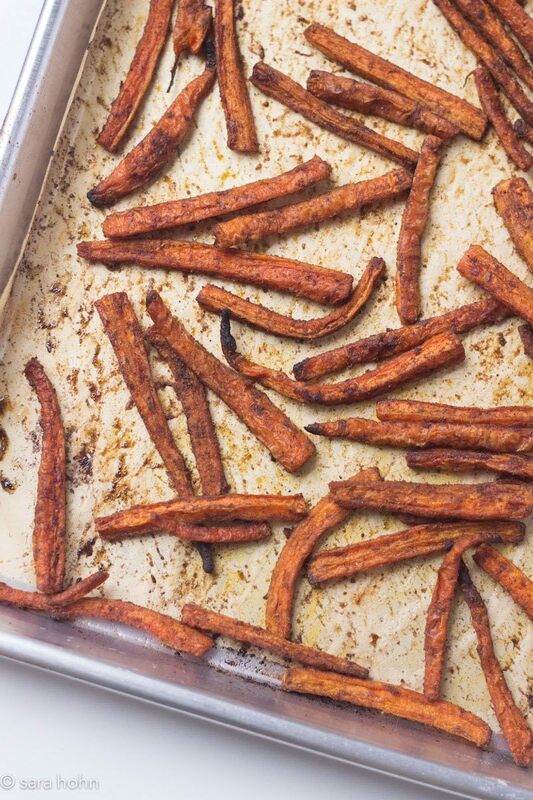 I prefer carrot fries to be overdone and crispy, so I cook them until the ends are almost (or, are) burnt. You can take them out before they get to that point, but I know I’m not alone in how I feel. Use this same recipe for other root vegetables like parsnips or sweet potatoes. Serve with ketchup, vegan ranch dressing or a simple tahini sauce for dipping. (2 T tahini, 1/4 cup water, 2 t lemon juice, 1/4 t salt). If camera-readiness matters to you, add some fresh chopped parsley. In a small bowl, combine olive oil, salt, paprika, ground cumin, cayenne and garlic powder. 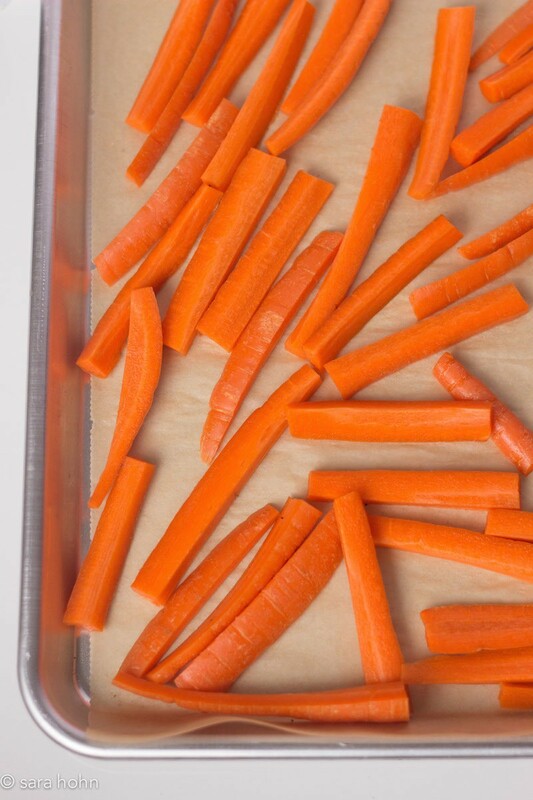 Toss olive oil mixture with sliced carrots. 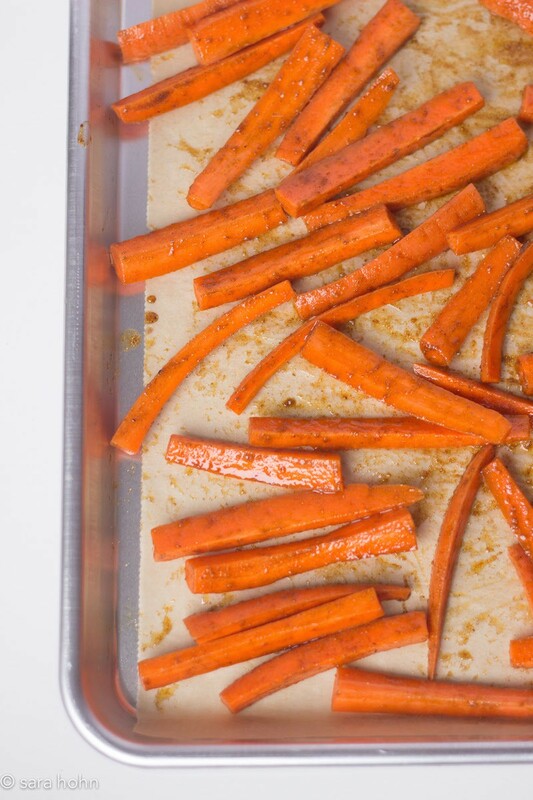 Spread carrots evenly on a rimmed baking sheet. Cook about 40-45 minutes, shaking the pan every 10 minutes or so for even cooking. Serve with tahini sauce or a creamy vegan dressing, if you like. Loved the carrot fries! Yum!!! !